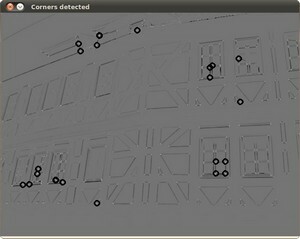 Use the function cornerHarris to detect corners using the Harris-Stephens method. 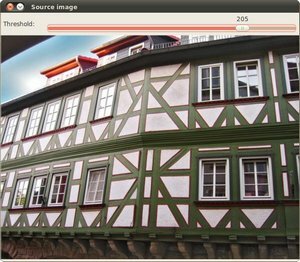 In computer vision, usually we need to find matching points between different frames of an environment. Why? If we know how two images relate to each other, we can use both images to extract information of them. When we say matching points we are referring, in a general sense, to characteristics in the scene that we can recognize easily. We call these characteristics features. So, what characteristics should a feature have? In this tutorial we will study the corner features, specifically. Because, since it is the intersection of two edges, it represents a point in which the directions of these two edges change. Hence, the gradient of the image (in both directions) have a high variation, which can be used to detect it. Let’s look for corners. Since corners represents a variation in the gradient in the image, we will look for this “variation”. Consider a grayscale image . We are going to sweep a window (with displacements in the x direction and in the right direction) and will calculate the variation of intensity. Why is a corner so special?